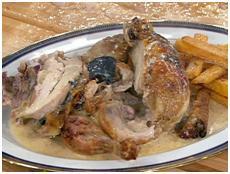 Roasted chicken is a favorite of many and ranks quiet highly on the list of even the most discerning foodies. Perfect for every occasion, it is an entrée that can never go wrong. Decadently delicious and charmingly crisp, those juicy bites promise to tantalize your taste buds. In short, roasted chicken is tasted at its tender best. To find out how to earn that well-deserved appreciation for your roasted chicken, read on. This recipe serves 4 to 6 people. The cooking time is 1 hour 60 minutes and the preparation time is 30 minutes. Heat the oven at 475⁰ F. Wash the chicken properly and drain the water. Use paper towels to pat it dry. For truffles, it is recommended that you take the ones that come packed in jars. Drain the liquid from the truffles and keep it aside. Now slice the truffles carefully. The slices should be thin. Keep 8-10 slices separately and keep the rest aside. Very carefully, loosen skin from the chicken breasts using your fingers and place the thin truffle slices between the skin and meat. Now take the chicken broth and season the chicken thoroughly with it on all sides. Rub salt and pepper on the whole chicken and tie the chicken legs together. Adjust the wings such that they are beneath the bird. Now take a Dutch oven and heat it with the specified quantity of olive oil. The oven should be large enough to hold the entire chicken. The celery, carrot and onion are to be scattered on the bottom of the oven. Wipe butter on the entire chicken and put it in the Dutch oven on one side. Add champagne. Cook the chicken for 20 minutes until it is golden brown in color. Change the side of the chicken and cook it again for 35 minutes. Turn the chicken after lowering the temperature to 375⁰F. Cook until you can see the juices running and the meat is tender. Transfer chicken to a plate and keep it warm. Now put the oven on stovetop and heat it on low flame. Get rid of fat from the drippings and add white wine to it. Cook and stir continuously. Add truffle juice and broth and cook until the liquid is condensed to half. While the liquid is condensing, take a small bowl. Add corn flour and butter to it and make a paste. Strain the liquid through a sieve and pour it into a saucepan. Add the remaining truffle slices and heavy cream and bring it to a simmer. Add about a half cup of butter-flour mixture while stirring continuously. Continue until the sauce thickens which will take about 10 minutes. Add pepper and salt to taste. Add any juices accumulated from the chicken. Cut the chicken in pieces and serve after pouring sauce over it.